DualShockers has been on a roll lately with reviews of third-party controllers, especially high-end ones targeting gamers going after an Xbox One Elite Controller experience on PS4. While other controllers offer the promise of a customizable experience, what about an entirely modular controller? That is what the SCUF Vantage brings to the table, and it is glorious. SCUF Gaming is a growing brand, but not necessarily a headlining one like Razer. However, they aren’t too far off when it comes to the third-party controller space after throwing their full weight behind modular controllers. You can’t have a review of third-party controllers without discussing the “feel” of it in your hands–the anecdote must be used in every controller review, but everyone remembers being passed an off-brand Mad Catz PS2 or GameCube controller that barely worked and felt like a Fischer Price toy. 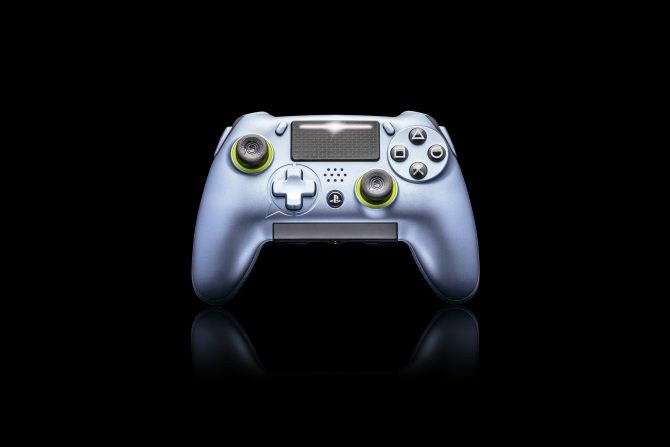 The SCUF Vantage is a far cry from those woes, bringing in a glossed front and matte/rubber pack that simply feels like quality. I can tell that I am holding a controller more expensive than the standard DualShock 4 (no relation). If a glossy front isn’t how you prefer your controllers, we have good news — like all things in the SCUF Vantage, that is a modular change and one that can be done by hand in under five seconds. 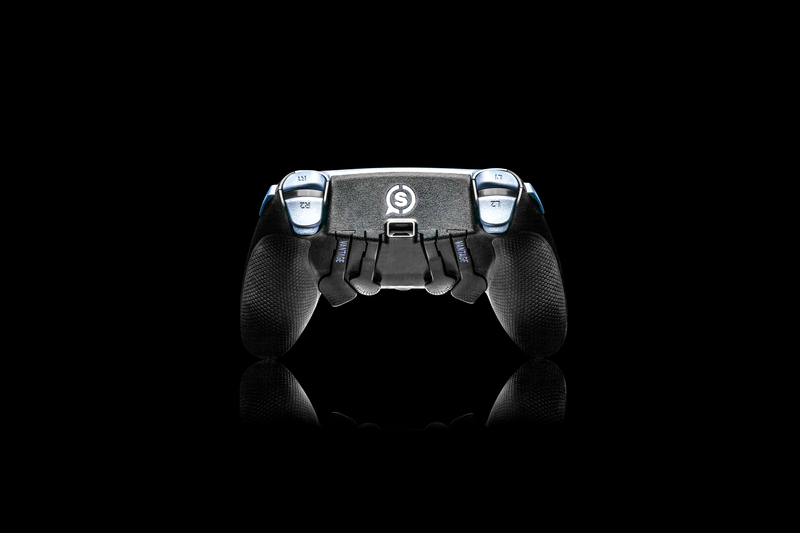 I’ve seen many controllers try to pull off the customizable faceplate method, but none have been as effortless as the SCUF Vantage. While the magnets keeping the faceplate on give barely any resistance when you make the swap, the faceplate fits and holds naturally as if it is a permanent part of the controller. The same can said about every other component on the inside of the controller. Thumbsticks? Tug them right out. D-pad? More like C(ya later)-Pad. Even the weighted rumble devices can be removed with barely any resistance, a boon to anyone looking for a competitive edge where rumble may make the difference. 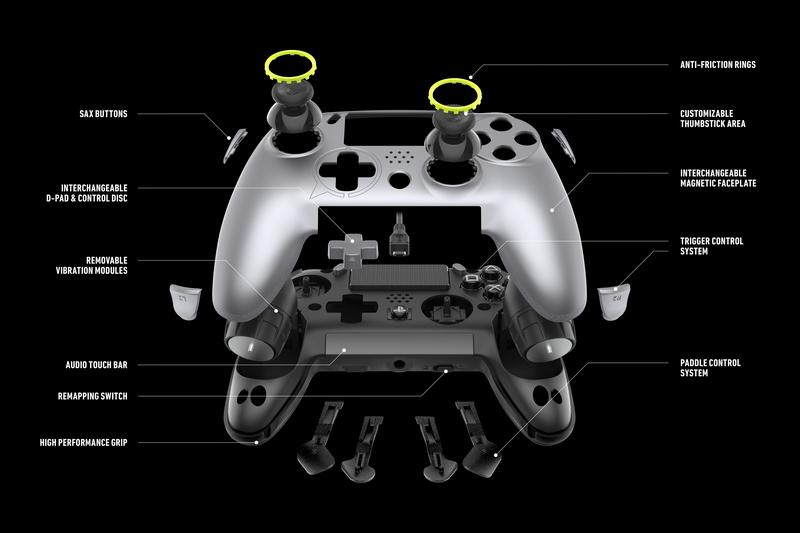 The modular design further extends to the exterior of the SCUF Vantage. The Sax buttons found on the outer edge of the controller (by the shoulder buttons) add another two customizable inputs, yet can be entirely removed. Triggers can be customized to lock at the exact spot needed to register input, creating less time between a trigger squeeze and the action on-screen. Outside of the actual hardware, players can customize other experiences with the hardware. Unlike pieces like the Razer Raiju, this is all done with the controller itself — not an unassociated app. For instance, remapping the keys is a simple process once you learn it–shifting a key re-mapping switch on the bottom of the SCUF Vantage and holding down a few keys will let you swap the paddles or Sax buttons at a moments notice. Also, if you grab the SCUF Vantage Wireless version, you can choose between playing with Bluetooth or low-latency wired connection. I spent the most time in Wireless mode because I’ve got some distance between my couch and my TV. However, I would be lying if I said I didn’t have the wire plugged in during my PvP sessions in SoulCalibur VI. I may not be at a level where milliseconds matter, but having the option to cut (prospectively) 100 milliseconds off your time is an excellent option for any eSport player no matter the game. Do all of these changes and modular designs really offer an improved gaming experience? Is the SCUF Vantage good enough that you won’t pick up your DualShock 4? No matter how great the design is, there is ultimately no point in grabbing a $200 controller if you can’t answer Yes on both of these. 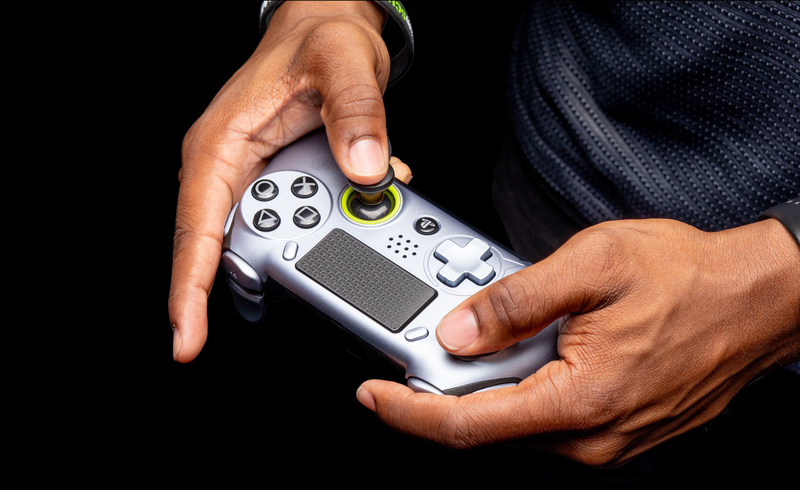 Thankfully, if you are the right type of person playing the right type of game, the answer will be a resounding “Yes.” I took the SCUF Vantage through its paces, bouncing between different genres of games with different layouts of controls. Naturally, the SCUF Vantage shines brightest when it comes to fast-paced titles that require a hair trigger. Between mopping up kills in Fortnite, hitting up Gambit in Destiny 2, or aiming for Pentakills in the console version of SMITE, I felt like I was getting a competitive edge. While I’m sure different people will use the controller differently based on playstyle, the Sax buttons managed to become a go-to sprint and grenade button, respectively. Meanwhile, I had mixed feelings on the controller as a DualShock 4 alternative when testing it out with other games. For instance, in my Halloween replay of Until Dawn, I’d rather go for a more basic controller with less going on–not that SCUF Vantage played poorly, but the DualShock 4 feels (comparatively) like your favorite band shirt that you put on every night. 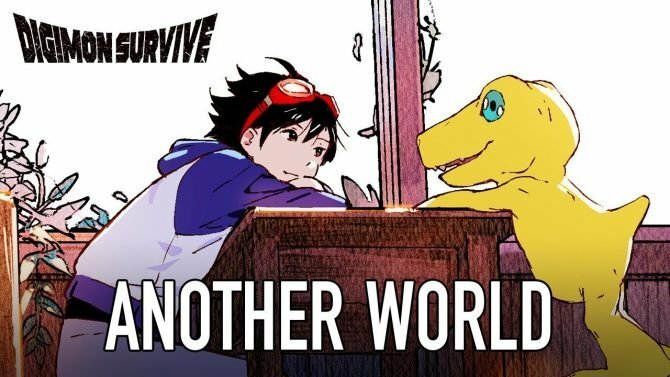 There are some games–mainly offline story-based ones–that feel better on a controller with less going on. With that said, I can also note that I had a similar thought when it came to SoulCalibur VI. However, I also realize I don’t have a skill cap that would benefit from the nuance of added button mapping. While we got the unit in well over a week ago, it’s taken us quite some time to get this review out — mainly because of concerns I’ve seen in the community. 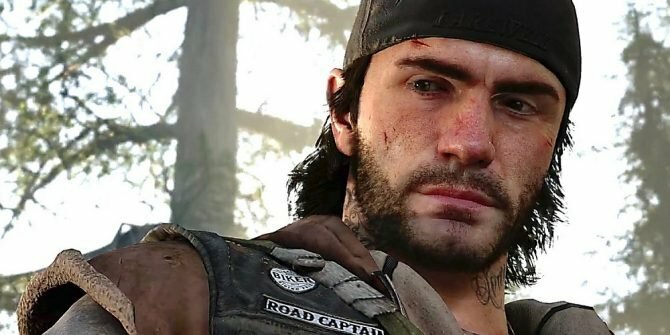 There is a small collection of content creators who have taken note of some common complaints from people who have already gotten their hands on it. This includes issues such as dead zones, sticking keys, not being able to turn on the PS4 with the Vantage Controller, and losing connection. Not noticing really any of these issues on our first few hours, we decided to dive back into the product to see what we missed… and we came up with bupkis, nothing, nada. No problems in the slightest. Sure, we think the DualShock 4 has more sensitive thumbsticks on micro-movements, but we never came up with an issue sniping. 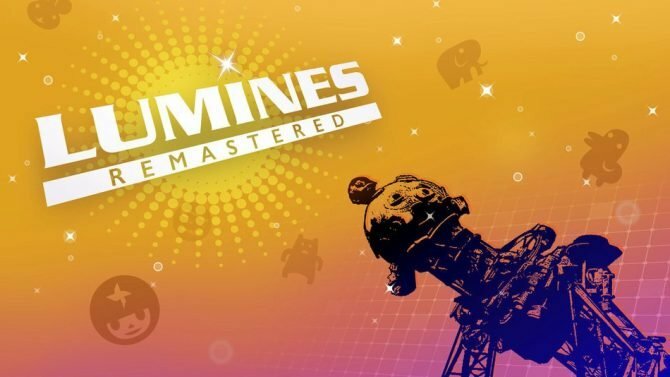 But all things considered, after 30-50 hours of gameplay we didn’t have one issue with our remapping, Bluetooth connection, or sticking keys. 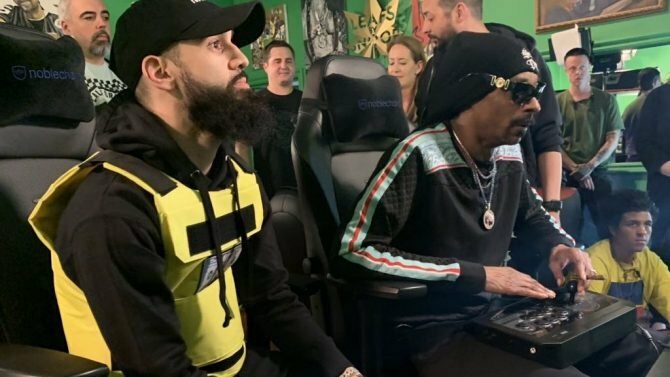 What I can gather out of this is that the SCUF Vantage likely is having some quality control issues, and not everyone will be getting a perfect controller. I don’t think there is any way to know how many are off-of-perfect, but it is definitely something worth acknowledging. It would be great if SCUF issued an official statement on this. However the warranty which extends to six months will likely cover any issue you see out the gate. Either way, we can only really review the product we received–not possible consumer issues over the internet that we don’t experience. 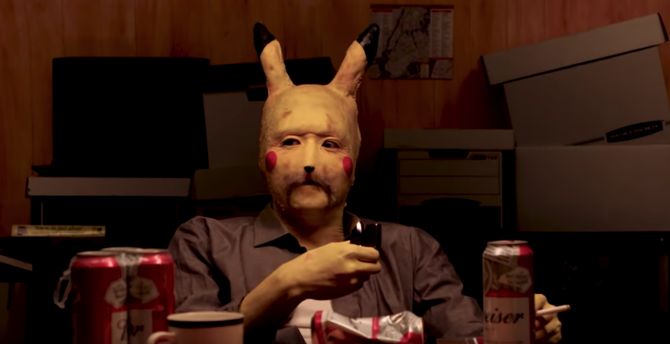 The bottom line, I suppose, is that it matters the type of gamer that you are. 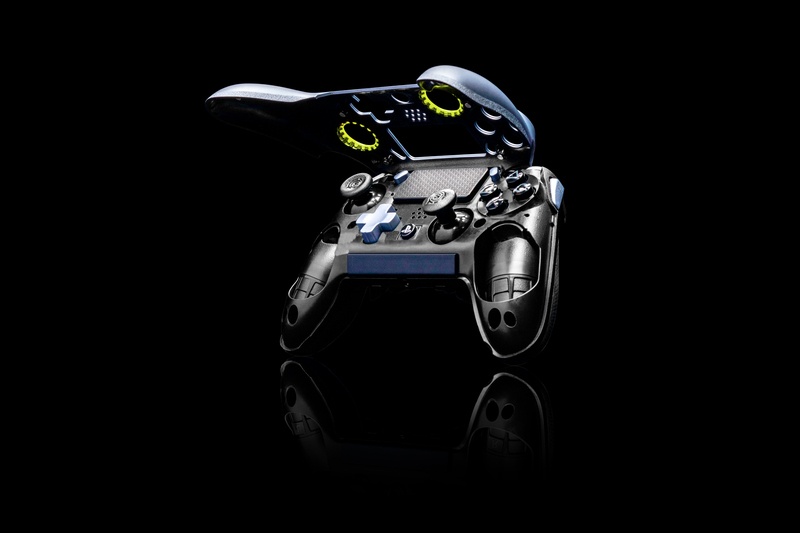 Anyone who can really dive into Fortnite, Overwatch, or the dedicated fighting game community (be it SoulCalibur VI or Tekken 7) will find a ton of use from the SCUF Vantage. And that is how it should be; the controller is specifically built for those people. And while it may not be the ideal controller for non-competitive games, it’s hard to not fall in love with the sleek modular design and overall feel of the SCUF Vantage. 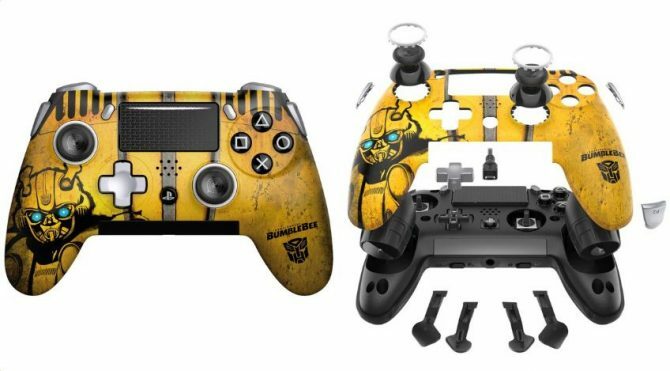 In a surprise move, at least to me, Sony Interactive Entertainment and SCUF controllers announced a new Bumblebee-themed Vantage PS4 controller. 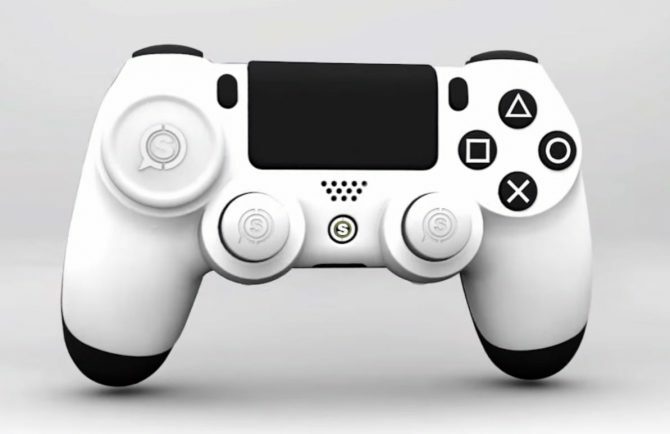 Scuf Gaming PS4 Controller Gets a Count Down: Release Date Incoming?